One way to take care of your delicates is to wash them by hand or if you have a wash by hand function on your washer then you can toss your delicates into these laundry bags and be done with what would take you hours just a few seconds of your time to do. We also use these for our curtains, silk sheets, hair tyes, doll clothes, bathtub toys, and legos. A great way to multitask when you are cleaning your home. I like that these bags have a little spot where the zipper is held underneath so it doesn't get caught on anything else while in the wash. This is an extensive set that has a huge bag right down to the roll cage bag which comes in handy for your bras that have metal. Another great idea is to give each of your children one of these and let them put their socks in them to cut down on the laundry you have to sort. 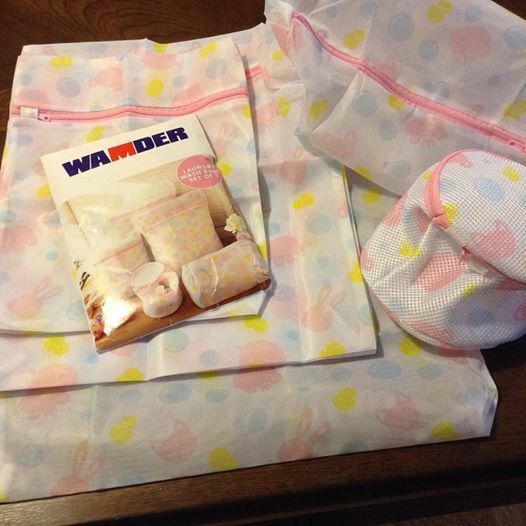 What Wamder has to say about their product. The laundry bag is made of air permeability and porous material, and the fear of deformation of underwear, sweaters or other items to put in, pull zipper and then be put into the washing machine. Now you can finally separate your delicates and precious garments during the washing! The days of ruined garments from washing are over! 1 Bra bag & 2 Small Bags (30*40) & 2 Medium Bags (40*50) & 1 Super-Sized Bag(50*60) & 1 Drum bag(35*25*25). If you've tried any ordinary laundry wash bags, you'll notice the InsideSmarts difference in no time. Our Wash Bags are made of premium-grade mesh that makes them as strong & durable as they are luxurious & smooth. If our laundry Bag construction quality, or anything about our product is not up to par: WE WANT TO KNOW. Our Top Priority is your satisfaction, and stand behind our premium products. Buy with confidence,if you're not satisfied for any reason, return your purchase for a 100% refund . Disclosure: MarksvilleandMe received one or more of the products mentioned above as part of a promotion with Tomoson and Wamder. Regardless, MarksvilleandMe only recommends products or services we use personally and believe will be good for our readers. Some of the links in the article may be “affiliate links.” This means if you click on the link and purchase the item, I will receive compensation. If you would like MarksvilleandMe to review a product or service please contact us at marksvilleandme@gmail.com.